The cholesterol in human blood consists of HDL Cholesterol (often called �good cholesterol�) and LDL Cholesterol (often called �bad cholesterol�). Risk of heart disease is related to the HDL level, total cholesterol level (HDL plus LDL), and other risk factors. The National Cholesterol Education Program guidelines state that a low level of HDL (�good�) cholesterol is associated with an increased risk of heart disease. 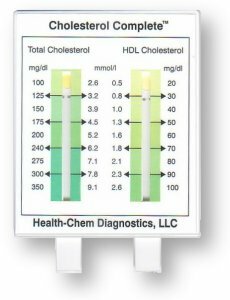 The HDL Cholesterol test strip panel of the Complete Cholesterol test device measures the HDL (�good�) cholesterol level. If the test result is 40 mg/dL or less, there may be at increased risk for heart disease, whether or not there are additional risk factors. If the test result is above 40 mg/dL, one cannot evaluate your risk of heart disease based on your HDL Cholesterol level alone. If there are other risk factors present, such as a high Total Cholesterol level, there may be an increased risk for heart disease. The Cholesterol Complete test kit also measures Total Cholesterol level on the Total Cholesterol test strip of the test device. The Cholesterol Complete Test kit allows one to approximate the LDL ("bad") Cholesterol level. A simple calculation of Total Cholesterol level minus HDL Cholesterol level will provide a fair approximation of LDL Cholesterol level. 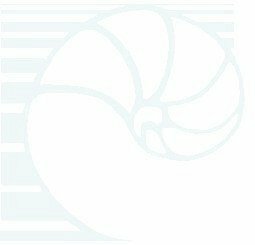 This calculation is based on an assumed normal Triglyceride level. When Triglycerides are elevated, the LDL level may be different than the above calculation. If LDL Cholesterol level is 130 mg/dL or less, the result is considered a desirable level. An LDL level of 130 mg/dL or above is considered borderline high and may suggest an increased risk of heart disease. *Note: Assumes normal triglycerides level. All results of 200 mg/dL or greater should be repeated by a quantitative laboratory method before a diagnosis of hypercholesterolemia is made. The Cholesterol Complete Test device includes test strips that are treated with special chromatic chemical reagents. A whole blood sample is absorbed on a receiving pad on the back of a test strip. The blood sample absorbs through to the front of a test strip and reacts with the reagents. The reaction area produces a color change that can be correlated to the cholesterol concentration in the blood sample by comparison with a supplied color chart imprinted on the test device. The test device incorporates a solid phase chemistry that employs the same principle as the enzymatic wet chemistries which are presently being used in many hospital laboratories. This enzymatic reaction makes use of a highly sensitive chromogen, tetramethylbenzidine, which allows for a visual determination of blood cholesterol. The test incorporates a unique cell separator as an integral part of the device. This separation device allows the use of whole blood as a specimen. The CHOLESTEROL COMPLETE test is intended for use with fresh capillary blood collected from a finger prick. Finger prick samples are a large drop of free flowing capillary blood. Excessive squeezing or "milking" should be avoided when obtaining samples as this can produce somewhat lower results. For a detailed explanation of the entire test procedure see the Product Instruction Sheet (.PDF). For a video of the complete test procedure see WATCH DEMO Simply, the finger is pricked with the included lancet to obtain a blood sample. Blood is then drawn up into the two specially metered capillary pipettes provided. Blood samples in the pipettes are then placed on the two absorbent test disks on the back of the test device, The test disks will change color based on the Total and HDL cholesterol levels detected in the blood sample. After 3 minutes and before 5 minutes, the color change is then visually compared to the color chart on the test device to determine the Total and HDL Cholesterol result. LDL cholesterol is then calculated by subtracting the HDL result from the Total Cholesterol result. The Cholesterol Complete (CHOL/HDL/LDL(calculated) Test is retail boxed. Each boxed kit contains all the components (noted above) to perform one complete Total, HDL and calculated LDL cholesterol test. Instructions must be followed precisely. For proper use watch the DEMO Kits are available in sales units of 1,3,6,12,24, 48 and 100 kits. For special quotations of 250 kits or more contact Customer Service.